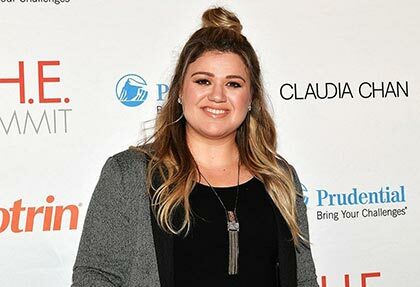 When Selena Gomez was picked on by a senseless troll over her apparent weight gain, the star shared a pic of herself looking gorgeous in a swimsuit, and added the caption: "I love being happy with me yall #theresmoretolove"
Twitter went wild when Kelly Clarkson clapped back at a body-shamer who made an offensive remark about her weight while she was innocently celebrating the 4th of July on social media. When the nasty little troll called her fat, she replied with the tweet: "....and still f**king awesome." Obviously her fans bowed down dutifully to her zero fucks reply with some pretty amazing memes on Twitter. It's depressing times when Lady Gaga gives the performance of her life during half-time at the Super Bowl, and still trolls are piping up to criticize the star's body. Gaga failed to stoop to their level, and instead shared an inspirational, body-positive message to her fans on Instagram. "I heard my body is a topic of conversation so I wanted to say, I'm proud of my body and you should be proud of yours too," Gaga wrote. "No matter who you are or what you do. I could give you a million reasons why you don't need to cater to anyone or anything to succeed. "Be you, and be relentlessly you. That's the stuff of champions. thank you so much everyone for supporting me. I love you guys. Xoxo, gaga"
Rihanna doesn't have time for negative comments about her weight, but she does have three hysterical emojis for those who seem obsessed with her size. When a fan defended the star against trolls with a video on Instagram of her picking out a pack of Cheetos and Ruffles (nice choice), Rihanna had the last laugh with the comment: "Somebody called me too fat?" Rih's not here for what you think she should look like, and sometimes a meme says it best. When the comedian and actress received a disgustingly derogatory comment about her gorgeous swimsuit cover for InStyle, she hit back with a picture of herself looking fit and healthy in a blue bikini. She also added the body-positive caption: "No haters can f with my baseline." No one can take on the great JK Rowling and not end up regretting it later. The Harry Potter author had the last laugh after she shared a pic of herself with Serena Williams and a troll tweeted that Serena "was built like man." "'She is built like a man.' Yeah, my husband looks just like this in a dress. You're an idiot." The Hollywood actress was as "appalled" as the rest of us upon seeing the offensive poster for her animated movie Red Shoes & The 7 Dwarfs, which appeared to imply that being fat equated to being ugly. After model Tess Holliday accused the movie of body-shaming, Chloe immediately set the record straight with the tweets: "I have now fully reviewed the marketing for Red Shoes, I am just as appalled and angry as everyone else, this wasn't approved by me or my team. "Pls know I have let the producers of the film know. I lent my voice to a beautiful script that I hope you will all see in its entirety. "The actual story is powerful for young women and resonated with me. I am sorry for the offense that was beyond my creative control." The Oscar-winning actress horrified fans when she revealed that someone in the industry once called her fat. Speaking to Harper's Bazaar UK, the star continued: "They brought in pictures of me where I was basically naked, and told me to use them as motivation for my diet." The Modern Family actress hit back at critics who suggested she looked "anorexic" in a photo she had posted on social media. The star—who underwent a kidney transplant in 2012 and battles kidney dysplasia—responded firmly on Twitter: "I'm not in control of what my body looks like. "No, that's not Photoshop, those are my legs, those are my arms. I write this because I've been accused of promoting anorexia, in, ironically enough, an anti-bullying post. And I want young girls to know that's not my intention." Sarah previously told Seventeen that she was born with "so many health issues that doctors told my mother I would never have a normal life." The Titanic star used her high-profile status as a platform to speak out against bullying and body-shaming. She said all the taunts she experienced as a child and young actress just made her stronger and even more ambitious. "I had been bullied at school," the actress told the crowd at the WE London event. "They called me Blubber. Teased me for wanting to act. Locked me in the cupboard. Laughed at me... I wasn't the prettiest. I was even told that I might be lucky in my acting if I was happy to settle for the fat-girl parts. [Casting agents] would say, 'You're just not what we're looking for Kate.'" "I fought back," she went on. "I had to ignore the negative comments. I had to believe in myself. I had to choose to rise above it all, and I had to work hard. You have to be indestructible to do what you love, and believe that you are worth it. And sometimes that's the hardest part... You are being your best and you own that. Nobody can take that away from you ever." The Girls star is sick and tired of irresponsible magazines rabbiting on about her weight, and she's said it before and she's saying it again: "I don't give even the tiniest of shits what anyone else feels about my body." She added: "Right now I'm struggling to control my endometriosis through a healthy diet and exercise. "So my weight-loss isn't a triumph and it also isn't some sign I've finally given in to the voices of trolls. Because my body belongs to ME—at every phase, in every iteration, and whatever I'm doing with it, I'm not handing in my feminist card to anyone." First Gigi had to defend her curvy figure, next she was standing up for her leaner size. Replying to a commenter who suggested she looked too thin, the model wrote: "It's called growing up. "Bodies change as girls become women, just as my mom's body changed at the same age. "Yes, I've lost some 'baby fat,' but muscle mass from my intensive volleyball training in high school has changed over the years into lean muscle from boxing and work stress can have its effect, naturally, but purposefully changing my body has never been my thing."